2. Answer the seven questions below. 3. Award ten other bloggers and let them know. 4. Share seven facts about yourself. This is a photo of me by the way...feel free to use the original image, I just wanted to change it. 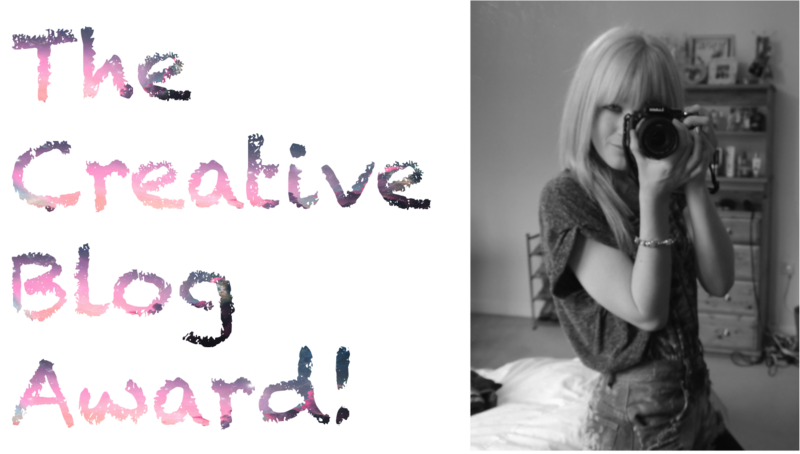 The other day I was lucky enough to receive the Creative Blog Award from the ever so lovely Mollie from musicandmollie! We're friends in real life and previously shared a blog, so if you'd all go and check her's out I'd really appreciate it :) She writes beautifully and her posts are always of such a high quality. 1. Name your favourite song: At the moment, I don't really have one (I know, what a letdown). It's kinda embarrassing but I'm going to see McFly in April so I've been busy re-listening to the sound of my childhood - Busted and Britney soon joined that playlist! 3. What ticks you off? It depends..most of the time it takes a lot to really annoy me but when in a bad mood the slightest thing will get to me, for example when people are pedantic and purposefully awkward...grrr you just wanna punch them...(I'm not violent really, promise). 4. When I'm upset, I... cry. Haha! Sometimes I think it's good to have a cry and just let it all out - but chocolate and a cuddle work just as well. 5. Favourite pet? Well I have 2 cats and one of them has decided he doesn't like me all that much and disappears for days on end...so I'm going to have to go for Poppie, the little fuzz monster that doesn't completely ignore me. 6. Black / White? Hmm...grey? haha...I like black jeans and shoes, but prefer white tops - black can be a bit harsh against my skin tone. 7. Biggest fear? Probably the fact that I have no idea what to do with my life and I really don't want to end up wasting it. "As we grow up, we learn that even the one person that wasn't supposed to ever let us down, probably will. You'll have your heart broken and you'll break others' hearts. You'll fight with your best friend or maybe even fall in love with them, and you'll cry because time is flying by. So take too many pictures, laugh too much, forgive freely, and love like you've never been hurt. Life comes with no guarantees, no time outs, no second chances. You just have to live life to the fullest, tell someone what they mean to you and tell someone off, speak out, dance in the pouring rain, hold someone's hand, comfort a friend, fall asleep watching the sun come up, stay up late, be a flirt, and smile until your face hurts. Don't be afraid to take chances or fall in love and most of all, live in the moment because every second you spend angry or upset is a second of happiness you can never get back." follow celebrities such as Paris Hilton or the Kardashians...I know it's trash TV but it's so addictive! This post is rather long so you can see 7 facts about me here on another blog award I received! I love that photo, the camera in the shot is such a classic pose. It was great to get to know you a little better, reminising childhood songs is one of my guilty pleasure pastimes too ! Paris and the Kardashians is not trash TV, it's amazing TV ;-). I'm totally feeling your chocolate love, the melty middle pudding are great, haha.